Developers are very much supportive of the government plans to build more affordable housing and are eager to participate in the programme. Real Estate and Housing Developers' Association (Rehda) deputy president Datuk FD Iskandar said there is a consumer demand for quality and affordable housing. "Developers are very much in support of building more affordable housing as we can see the demand is there. "PR1MA (the 1Malaysia Housing Programme established by the government) cannot do it alone and we are willing to cooperate with them," he told Business Times in a recent interview. Rehda, he said, fully supports the good intention of the federal government to build more affordable homes. 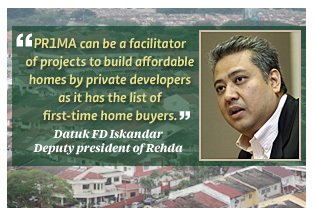 Iskandar said affordable houses are not a new concept. When the Selangor State Economic Development Corporation was established in the 1970s, its goal was to build affordable houses. "Sadly today, PKNS is selling houses that are priced more than RM1 million. "Where is their social responsibility? They get cheap land while private developers pay market rate. On top of that, PKNS gets other benefits. Yet they are building expensive houses," he added. Iskandar, who is also Glomac Bhd group managing director, said developers are willing to work with PR1MA in building these affordable homes. "PR1MA can be a facilitator of projects to build affordable homes by private developers as it has the list of first-time home buyers," he added. The federal and state governments could also identify pockets of land in their respective areas to be tasked to private developers to build affordable homes. "The authorities can even stipulate that this developments must have as high as 50 per cent of affordable units," he said. In this respect, Selangor has a crucial role to play as it still has plenty of land to be developed. The state must do its part in solving the housing woes of the rakyat, especially the middle-income. "The high-income earner has no problems buying houses. So too the lower-income earners who are entitled for low-cost houses. "It is the middle-income group which is feeling the pinch," he said. However, Iskandar said buyers must also change their mindset in choosing the location for their houses. "You cannot expect to buy an affordable unit in Bangsar (Kuala Lumpur) at RM300,000. An affordable unit there might be RM1 million, while those in Shah Alam RM400,000 and Rawang RM300,000," he said. Private developers are already building affordable houses but it may be a bit far from Kuala Lumpur where the land cost is cheaper. That is where a better public transportation system will help make these places more accessible to buyers. "In this respect, I salute the federal government for biting the bullet to build the multi-billion ringgit Light Rail Transit (LRT) and the Mass Rail Transit (MRT). "These projects will make more outlying areas accessible to home buyers whose travel time from home to office will be very much reduced. "After saying this, feeder services should be enhanced so that the public can easily access the LRT or MRT stations," he added. On rising prices of houses, Iskandar said it does not mean that developers are making bigger margins now. In fact, he said, when he first entered the business 23 years ago the margin was 25 per cent. Now he is happy if he gets 15 per cent. Among the main reasons for the reduced margins are the cost of land, building materials and labour. Recently, the Selangor state government had imposed a 30 per cent development charge on all improvements that it has allowed on any development land in the state. The Caj Pemajuan 2010 indicates that all approved planning permission and approved extra floor area or space would attract a development charge and local authorities in the state are allowed to charge a 30 per cent fee and a 20 per cent of the difference in value due the permission being granted. These additional cost would certainly contribute to the rising house prices, he said. Iskandar said the Selangor state government must also help to alleviate the housing problems, especially of the middle- income earners. By 2020, it is projected that the population of the Greater Kuala Lumpur area will rise from 4.5 million people to 10 million. Assuming that the average household has four persons, it would mean that there is a need to build 150,000 new houses a year as compared to 200,000 new and old homes sold nationwide last year.